So first, the written exam. It is administered twice a year, once around the end of December, and once around the end of May. I will be taking it on December 4th this year, so mark your calendars now to wish me luck and think positive thoughts for me! The written exam consists of two main parts. The first is a multiple choice section (or as they call it here in Israel, an “American style” exam), for which you have 1 hour. There are 50 questions, with 4 answers each, and you must answer 45 of them. The topics cover virtually any topic covered in the course, and the first page typically focuses on science things, such as botany, zoology, geology and meteorology. Which of the following was the center of Umayyad rule in the 7th century? As you can see, they come from many different subjects. For those checking themselves, the answers above were 3, 2 and 2 respectively. Those 45 questions add up to a total of 30 points, meaning each question is worth 2/3 of a point. If you answer more than 45, only the first 45 are checked. 1. The tour must include the regions above, and should be limited to the designated area (see attached map). 2. A half day to a full day should be dedicated to the Golan Heights. 3. Christian sites should make up no more than a half a day of the tour. 4. Elaborated points must be in the Golan Heights and related to the tour theme. 1. The tour must include at least two ancient water projects or installations and one current water project. 2. The tour should be limited to the designated area on the map and included the following regions: the Coastal Plain, the Judean Mountains and Jerusalem. 3. At least one-half day should be spent on the Coastal Plain and one-half day in Jerusalem. 4. The elaborated point must be related to the tour theme. 1. Do not deviate from the regions marked on the map. 2. All the marked areas must be included according to the following schedule: the first day in the Judean Lowlands and the Jerusalem Hills and the second day in Jerusalem. 3. The night may be spent in Jerusalem or outside it. 4. Elaborated points must be in a historic-archaeological site within the area marked on the map that is not in an active religious site. Once you have selected your group, you have a few things to do. Firstly, you write a slightly more in depth description of your group, clarifying it beyond the bare-bones description they provided. For example, with group number 3 above, you might describe a bit further about what type of Protestant group they are, where they come from, and maybe a bit more about their specific interests. You also have to write out two days of itinerary, listing the various sites you will stop. The answer sheets have a series of blocks in which you indicate the amount of time you are spending at each location (and breaking it down further for larger sites, into multiple boxes). You also write brief lines about what you will talk about at each location, and what guiding aides you will use. The third portion of Part B is your Elaborated Guiding Point. For this part, you pick one location from your full itinerary (choosing one according to the guidelines provided in the group description) and write a full page as if you were actually guiding there. You write exactly, word-for-word what you’d say, and indicate any guiding aides you’d be using. To be honest, I forget exactly how this section breaks down, but of the 70 points on Part B, about 30 come from the Elaborated Point. To pass the written exam, you need to get somewhere between 60 and 65 points I think (again, I forget). 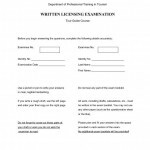 Bottom line, if you pass the written licensing exam, then you can take the oral exam. If you fail, you must take the written exam again and pass it before you can take the oral exam. At the oral exam, you present in front of a panel of professionals including someone from the Ministry of Tourism, a tour operator and an experienced tour guide. You begin by handing them a 1-day itinerary and group description that you have created. In this case, unlike on Part B of the written exam, you have complete freedom to choose who you want to guide, where and on what topics. You indicate a spot from within that itinerary that you will be presenting and then speak to the panel as if they were the group, and as if you were at the site. You use visual aides and the like, and do whatever you’d do if you were in front of a group at a real site. It is basically role playing, and they want to see if you are capable of guiding on a practical basis, beyond simply having the knowledge that you need to pass the written exam. You prepare to speak for about 10 minutes, but they usually stop you by the 7-minute mark, or earlier. Then they ask you various questions based specifically on the guiding point you presented and/or the rest of your day’s itinerary. They may also ask you about other related material. After this, for another 10-15 minutes or so, they proceed to ask you questions about absolutely any site in Israel and any of the material covered in the course. They will almost always ask you a question to which you do not know the answer. In fact, they will probably try to find such a question. This is not because they expect you to know everything and are looking to trip you up. Rather, they recognize that it is virtually impossible to know everything, and you will definitely receive questions from tourists to which you do not know the answers. They are looking to see how you handle yourself when faced with a question for which you do not know the answer. 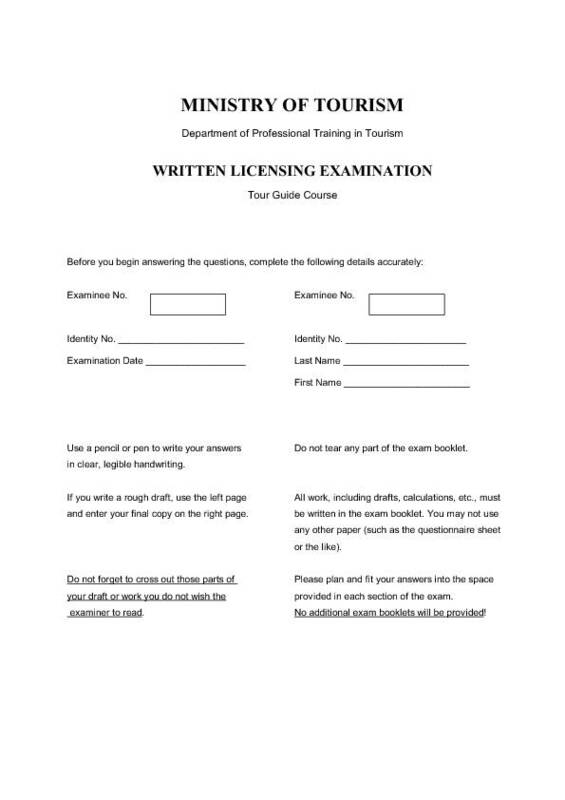 If you pass this portion of the exam as well, then you receive your license and are free to work as a tour guide in this fabulous country! If you do not pass, you may take the oral exam again. You do not need to take the written exam again once you have passed it once. If all goes as planned on December 4th and I pass the written exam, I should be taking the oral exam sometime in January, and then will hopefully be licensed and ready to embark on my new career. You know I’ll be keeping you posted! Good luck with the exams. I am at starting to look at studying in the next intake of the English course in Jerusalem. Where are you studying??? I am doing the English Language course at Lander Institute. Look through the blog and you can see some reviews I’ve done of the school and program in general. Sounds really tough :). I’ve never realized how much work goes into getting the license. Thanks for sharing. Thanks for joining the fun over here. Hope you’ll keep on reading more.